The warmer weather and longer days have brought us all back to life. We all have more energy and motivation not only to get things done but to make an effort to have FUN! Today was a wonderful day filled with a good mix of productivity, relaxation and fun. Our usual Monday play group was postponed until Wednesday so we spent the first half of the day at home and went in to the dance studio to do some office work after nap. After dinner, we went for a family walk and then David took care of bedtime so I could go to a meeting for our local beekeeping association. I am so glad my energy is close to normal again so I can take full advantage of these first tastes of Spring. They are my favorite! 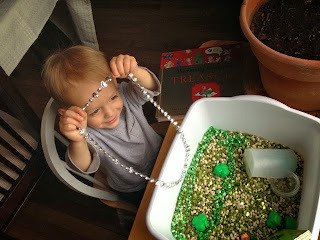 St. Patty's Day sensory play! Tomorrow is going to be even warmer with a high of 70*! I think we may go for a jog at the park. We also have a midwife appointment tomorrow and we are looking forward to hearing Baby again. Here's what we were up to one year ago today: "Boy: Noise With Dirt On It"
And two years ago today: "7 Weeks"